This conditioner quenches the driest hair with a fusion of gentle conditioners and moisturizers, giving hair silky new life. Scientific studies show that just three washes helps repair damage, providing the three key elements that give hair life—strength, softness and shine. And in a clinical study, 92% of women thought their hair was more moisturized after just three uses. Targets and fortifies the weakest part of the hair. Wheat protein has long been used in hair care products. 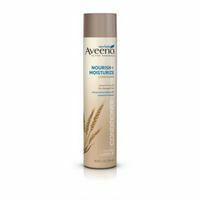 AVEENO® scientists have identified an optimal blend of wheat protein and wheat germ oil that harnesses the benefits of wheat, and allows products containing this blend to target damaged areas of hair. This unique formula has been proven to restore the three elements that give life to hair‑strength, softness and shine‑ in just three washes.